Dr. Lightman showed the law enforcement class how micro expressions helped him find out where this nasty, Nazi-sympathetic, orange-suited, prisoner had planted a bomb. While the prisoner kept his mouth shut he couldn’t prevent a micro facial expression of delight slipping out when he learned from Lightman that the FBI was wasting time, searching the wrong church. When Lightman told him he had figured out that the FBI should look elsewhere, the suspect broke his silence: “You don’t know what you are talking about”. The leakage this time wasn’t in the face, but a gesture – a one-sided shoulder shrug that contradicted his words. Catching that contradiction reassured Lightman he was going in the right direction. In these few seconds ‘Lie To Me’ illustrated two of the most valuable sources for clues to deceit. I call them leakage because they occur despite a person’s intention not to reveal the information that leaks out. Typically people who leak don’t get wet; they don’t know that the information has leaked. Micro facial expressions are involuntary; the person showing a micro expression is unaware of doing it. Most people don’t see micro expressions unless they have obtained training. 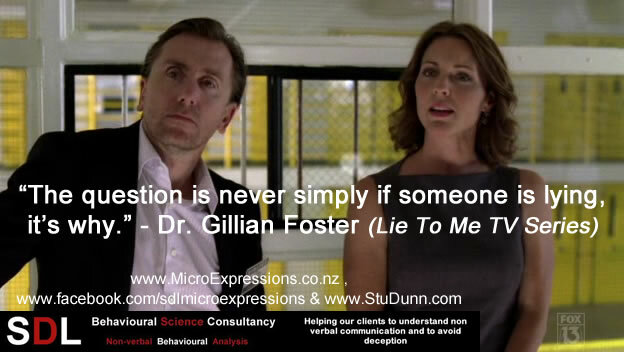 My newsletter Reading Between the Lies explains more about why and when micro expressions occur, and how to best use the information they reveal. Typically emblems are made in what I call the ‘presentation position’, very noticeable because they are performed right in front of the person making it and very pronounced, with a beat. Emblematic slips are made outside of the presentation position, and usually they are only a fragment of the full emblem, performed without a beat. That is what the prisoner did, he showed just a fragment of the shrug that means ‘I don’t know’ or ‘I can’t do it’. The person showing the emblematic slip knows what he or she is thinking but doesn’t know it has leaked out. More about emblems in the third issue of my newsletter Reading Between The Lies. More than a hundred years ago Charles Darwin predicted that facial expressions of emotion are universal. To celebrate the 200th anniversary of Darwin’s birth his book The Expression of the Emotions in Man and Animals, which I edited, was just published by Oxford University Press. Lightman is right that people often look away when they are trying to remember something, but you might have missed how Lightman could be so certain that it was proof the boy was lying. People look away when they are thinking carefully and considering each word before it is spoken, not just when they are making it up. The boy knew his teacher was murdered and he is the prime suspect. He would be wise to be cautious in giving his answers. But Lightman noted that the boy wasn’t cautious, didn’t look away, when he answered other questions. It is this difference that made the difference, which justified Lightman’s interpretation. Lightman correctly said that breaking eye contact doesn’t prove lying; that is a myth. Oblique eyebrows are a very reliable sign of sadness. Very few people can make this movement voluntarily, so it is virtually never faked. And few people can prevent it if they feel sad. “Pilot” – Yes or No? Note that it was slight, not pronounced. I have seen this in my research subjects when they lie and in real life criminal and celebrity lies many times. This entry was posted in Analysis, Body Language, Emotions, Evaluating Truthfulness and Credibility, Facial Expressions, Psychology and tagged lie to me, paul ekman. Bookmark the permalink.